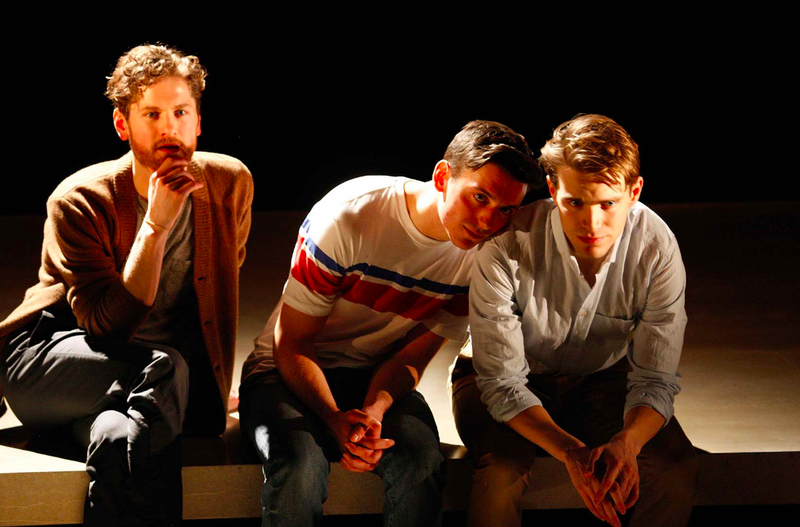 The Inheritance is an exciting new play making its world premiere at the Young Vic, and we caught up with one its stars, Samuel H. Levine. The play focuses on different generations of gay men in a post-AIDS New York city, and their lives and loves. We had a few questions for Samuel about the play and what it means to him. 1. Did you train in acting, if so where? I went to LaGuardia High School for the performing arts (The Fame School), and then studied acting at the California Institute of the Arts for two years before dropping out to work professionally. 2. What was your earliest experience of theatre like? My earliest experience of theatre that I can really remember, was seeing Viola Davis in Fences and hearing her deliver this heart breaking speech. I remember sitting at the edge of my seat and feeling like everything else disappeared around me. 3. We’ve asked different actors over the past year, of all of the mediums you’ve worked in, why theatre? I love theatre because it’s a collective experience, both for the actors and the audience. For the actors, it’s a bunch of strangers coming together to build something. And with the audience, we all get to experience something together during a performance, experience something that cannot be repeated and is unique. We are all breathing the same air, and living together inside the theatre for a time. It’s a beautiful and exhilarating feeling. (L-R) Kyle Soller, Samuel H. Levine and Andrew Burnap. Photo by Simon Annand. 4. How would you describe your character in ‘The Inheritance’? I play two characters in The Inheritance, they are kind of like two sides of the same coin. One is extremely privileged and well off, has been given the world on a silver platter, and the other has been beaten down his entire life and has been stripped of everything. But, ultimately, they are both young gay men searching for community and for their place in the world. 5. The story deals with a group of gay men living in New York – is there something in particular you’ve learned about that community from this experience? I can only speak about the community specifically depicted within the play, but I love the way they lift each other up. When New York City or their political climate seems to heavy a burden, they are always there for each other, and I love that about this particular community of men. Samuel H. Levine and Andrew Burnap. Photo by Simon Annand. 6. What has your experience been like working with Stephen Daldry? Working with Stephen Daldry has been eye-opening, rewarding and whole lot of fun. Rehearsals feel like a roller-coaster, in the best possible way. He has such a brilliant eye. He sees your instincts before you even do, and then with gentle guidance he leads you towards them. Stephen allows you the space to make your own discoveries and to make mistakes, which results in a show full of risk-taking and ownership and raw acting instinct. I think London audience will come away from this show with a sense of compassion and love, an understanding of the epidemic (a part of history too few people know about). A desire to heal and hopefully they’ll feel inspired to tell their own stories, whatever they may be about. Related blogs: 7 Quick Questions for John Benjamin Hickey. Want more? 5 Reasons to See Strictly Ballroom.